Take shortcuts: Items like frozen fruit, rotisserie chicken, microwave brown rice or quinoa and pre made chicken burgers are perfect examples of taking some help from the grocery store so you aren't spending hours slaving over the stove! Stores are now also selling great frozen items such a zucchini noodles and riced cauliflower! If you want a super easy no-cook meal prep, check out THIS ONE. Mini Prep: If a full meal prep is too much for you, start with little things that will make life easier during the week. Cutting fruit, boiling eggs, chopping up veggies or portioning out nuts and dried fruit are all great little things that can be done to ensure you always have a healthy snack on hand. Get fun containers: Maybe it's a mental thing, but having great containers can make you feel like a meal prep ninja! I like these one-compartment containers from Amazon or if you want to get fancy, get the ones with the compartments like THESE. Large mason jars like THESE can be found cheap at the dollar store or Michaels and make great jars for salads. Need some mason jar salad ideas?? Check out these! Meal prepping can seem intimidating at first, but if you just keep it simple YOU CAN DO IT!! Setting aside as little as 20 minutes on a Sunday can help tremendously throughout the week and help keep you on track with your health and fitness goals! Quick and Easy Meal Prep for Breakfast + Lunch + Snacks! Ready for a SUPER quick and easy meal prep?! No joke, it took me longer to find all the lids to these containers than it did it prep my breakfast, lunch and snacks for the work week!! Breakfasts: Breakfast for me is always either Chocolate protein shake with either a banana or pineapple. I get my daily dose of superfoods and it's done in 2 minutes flat! If you aren't a shake person, try making these overnight oats! Snack 3: Veggies and Dressing. I like to cut up fresh veggies and portion them out for the week. I did celery and carrots this week with Bolthouse Farms Classic Ranch. I like to portion out dressing for the week so it's just grab and go! Lunches: Chicken Burgers with Simple Citrus Slaw. I love these Don Lee Chicken Burgers from Costco but any lean, no antibiotic chicken burger will do! I just throw a frozen burger onto the slaw and I'm good to go! Here is the Simple Citrus Slaw Recipe--so easy!! Add the carrots and cole slaw to a large bowl. Whisk dressing ingredients together and pour over veggies. There you have it! Breakfast, lunch and snacks for the week!! Back to school time!!! Although it's great to get the kiddos back to school and get back into a routine, I sometimes miss the relaxed "lack of routine" of the summer. Back to school seems to just hit with a vengeance! Paper to sign! Lunches to pack! Practices! Homework! Oh my!! 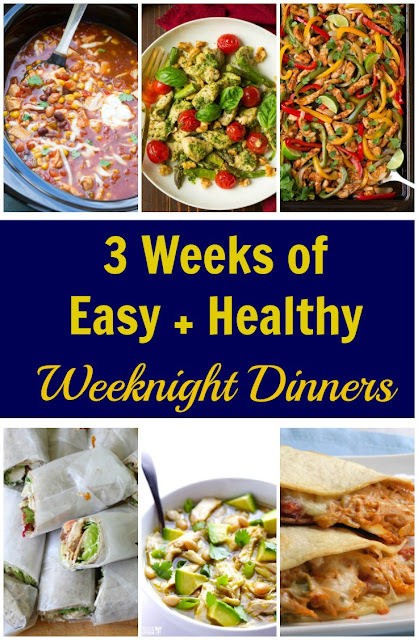 Dinner and healthy eating can often be tough when life gets busy but I have you covered with my 10 Easy + Healthy Weeknight Meals for Back to School! Sheet Pan Dinners: There's nothing easier than putting everything onto a baking sheet and let the oven do the work! These meals can be prepped a couple of days in advance, too and just heated up as you need them. Portable: For meals on the go! Crockpot: Who doesn't love throwing everything in a crockpot and having a delicious hot meal when you get home??! Leftovers: These meals are make great leftovers. Just Simple: These meals can be made in about 20 minutes or less. Chicken Fajitas: Just use a store bought low sodium taco seasoning to simplify this more! 2. BBQ Smoked Sausage and Veggies: Keep it healthier and use turkey or chicken sausage. 3. Pesto Chicken: Just use a good store bought pesto--my fave is Kirkland brand from Costco! 1. Cobb Salad Wraps: Wraps are GREAT for wrapping up and eating on the go. Customize this cobb salad wrap with whatever you favorite wrap ingredients are! 2. Quesadillas: This is my family's favorite portable meal. I make up a bunch, fill it with their favorite "fillings" (deli meat, favorite cheeses, chicken, etc.) wrap them up in foil, pack some fruit and it's dinner on the go! This is also a great use for leftover chicken or taco meat. 3. Pasta: A thermos is great for keeping pasta hot for an easy on the go meal! Use your favorite pasta recipe or try this one pot fave of mine: One Pot Chicken Fajita Pasta. 1.Seasoned Chicken and Potatoes: This is one of my family's favorite crockpot recipes and it's SUPER simple! The cooking time is not long, so if you will be gone most of the time, set your crockpot's timer, if possible. 2. Taco Soup: I love this "dump and go" recipe! Feel free to substitute lean ground beef or turkey, but brown it in a skillet first. 3. Lasagna Soup: Italian chicken sausage works great but you can use ground beef or turkey too. The leftovers make a perfect lunch. 1. Turkey Meatloaf: I think the leftovers are better than freshly-cooked! Ha!! Great on a sandwich too for a portable meal! 2. Philly Cheesesteak Sloppy Joes: Whip up a double batch and have an easy and portable meal for the next day, too! 3. Lemon Broccoli Pasta Skillet: The kids pick out the broccoli and love this pasta and I am 100% fine with that! Serve it with a salad and/or bread the first night and the next night, heat it up a bit and put it in a Thermos for another easy on the go meal. 1.Breakfast for dinner: This is my son’s ALL TIME favorite meal. I love it because you can customize it for everyone’s preferences. You can check out how we do ours in THIS POST. Put four chicken breasts in your crockpot with one container fresh salsa (from the deli) and a half a packet of low sodium taco seasoning. Cook on low 4-5 hours until chicken shreds easily. Serve in tortillas with lettuce, sour cream, avocado and whatever other taco toppings you love! 3. White Chicken Chili: I LOVE how this recipe uses store bought rotisserie chicken and store bought salsa verde! I LOVE me a good burger, let me tell you! These Greek Turkey Burgers are a lighter version is perfect for summer. I serve it up piled high with my delicious Tzatziki Sauce and a simple Cucumber and Tomato Salad. Serve it on a toasted bun, on lettuce leaves or just plain like mine! This recipe serves 4-5 and is delicious the next day as well. 2. Combine all ingredients in a large bowl. With your hands, mix together until everything is well mixed. 3. Form into (5) 5-inch burgers and place on baking sheet coated with cooking spray. 4. Broil for 5-7 minutes on each side, until cooked through. 5. Top with Tzatziki Sauce and serve with Cucumber Tomato Salad! Think You Can't Cook? Try These 3 Simple, Healthy Recipes!! So you might be really good at EATING and LOVING food, but how are you at cooking it?? Or maybe you just feel too tired and busy to make a healthy meal for your family every night. Having a rough "dinner plan" for each day of the week. Get my weeknight meal plans HERE. Here are THREE simple, healthy recipes you can make that your family will love...and they require VERY little (if any) actual "cooking." 1. 3 Ingredient Salsa Chicken: Easiest recipe on the planet and everyone in the house is happy! Put four chicken breasts in your crockpot with one container fresh salsa (from the deli) and a half a packet of low sodium taco seasoning. Cook on low 4-5 hours until chicken shreds easily. Serve in tortillas with lettuce, sour cream, avocado and whatever other taco toppings you love! 2. Sheet Pan Dinner: I LOVE sheet pan dinners because they leave VERY little to clean up and everything is done right on one pan. Mix and match your veggies and protein--i love Trader Joe's Chicken Sausage. If you want to make things even easier, nix all the seasonings and toss everything with a little store bought Pesto. This is my FAVE! Pancakes: We LOVE these whole grain protein cakes! Check out this video and see how I used to be a disaster in the kitchen and how I turned it around!! "I want a snack, I want a snack, I want a snack!!!!" Have you seen that video from a few years ago that went viral?? Or maybe it sounds like kids in YOUR house??! With my kids home for the summer, I know those are some of the most frequently spoken words in our house!! Today I have a tip for you that might help with this along with 10 easy snacks that will keep your kids FULL! Use whatever quantities of the items as you like--one of the beauties of cooking for yourself is being able to customize your meals to fit YOUR taste! 1. Whisk all ingredients in the dressing and set aside. 2. Combine all salad ingredients, toss with the dressing and serve! Enjoy this light summer meal! Ever had a sugar craving??!! Of course you have! Who hasn't??! Sugar--we've been told by many that it's the enemy these days! The typical amount of sugar we are "supposed" to consume (a number set by the powers that be) is around 25 grams for women. The average person consumes over 82 grams! Wowza! And it's so easy to do--there is sugar in EVERYTHING--from bread to salad dressing. We ALLLLL have those times times where we just need "a little something sweet." Usually this happens to me after dinner. Instead of wolfing down a huge piece of cake (55g of sugar) or a candy bar (35g of sugar) or a Starbucks Frappuchino (about 46g in a Tall)....here are some other options that won't blow your daily sugar intake out of the water!! They are small, but mighty! This is my go-to snack for a sugar craving! They are great to throw in your purse for a snack on the go! I am telling you this is the #1 thing I give credit to for curbing my sugar cravings all day! Plus it's packed with vitamins, superfoods and pre and pro biotics. Chocolate is my favorite when I get an afternoon sugar craving, but this Strawberry "Mojito" one rocks my world too!!! This "dessert" is one of my very favorite sweet treats! You can pull it together in about 1 minute! I mix 2 tablespoons of peanut butter with about 1 tablespoon of water....stir until water is incorporated and it's nice and smooth. Drizzle in honey and stir for a smooth, creamy and SWEET dip with apples! It doesn't get much easier than this! The bulk containers in the grocery store have endless options. Just be sure to get fruit without extra sugar added. My faves are pineapple and mango. Throw some apples in the slow cooker with a little brown sugar (or coconut sugar), cinnamon and nutmeg and you have dessert for the whole week! Add a little vanilla frozen yogurt for an extra sweet treat! I have never had REAL Dole Whip so I don't know the difference between this and the "real" version. All I know is that this is something I could eat every single day!!! Combine all ingredients together, stir and adjust seasonings. Chill for about an hour to let the flavors marry together. It doesn't get much easier than that! You can prep the ingredients beforehand and keep them in the fridge until you are ready to cook--the meal comes together in minutes! Stir fries make awesome leftovers for lunch the next day! It's PRETTY! I mean, how pretty do these veggies look??! 1. Whisk together first 7 ingredients and set aside. 2. Heat a couple of teaspoons of olive oil in a skillet; add peppers and onions and stir until slightly soft. 3. Add zucchini and garlic; cook about one minute. 4. Add broccoli and the sauce; stir to coat. If the sauce gets too thick, add a little more stock. 5. Cook, stirring every so often until broccoli is crisp-tender and the other veggies are cooked. 6. Serve over quick cooking brown rice, noodles or zoodles!! Hey friends!!! Well, summer might not "officially" be here, but the sun is out, the days are longer and that means it's GRILLING TIME!!! Living in California, we grill pretty much year round so frankly, it can get a little old and I run out of grilling recipes really fast! Tip: Grill up some extra chicken for lunches later in the week! 1. Whisk all ingredients (minus the chicken!) in a small bowl. 2. Place chicken in a large zip top bag. Pour marinade over chicken and seal the bag. Place in fridge. 3. Marinade for 3-6 hours. 4. Grill the chicken breasts and serve alongside brown rice or veggies!